‘Special branch operatives tailed a UFO cult leader who said he was in telepathic contact with aliens, it emerged today’, announced London’s Daily Express on 28 July. The source of this story is a dossier released by the Metropolitan Police in 2005 in response to a Freedom of Information request ‘for information on George King and the Aetherius Society‘. A summary of the contents was published in my book with Andy Roberts, Flying Saucerers: a Social History of British UFOlogy, published by Heart of Albion Press in the following year. …members of the Aetherius Society distrusted existing political and scientific establishments. They wanted to see the end of all wars and believed that by challenging the status quo a utopia could be realised. This wasn’t what middle England, now in the post-war economic boom really wanted to hear. 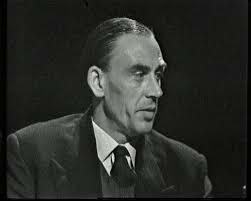 In a decade as politically and socially paranoid as the 1950s, it was only a matter of time before George King’s activities would come to the attention of the intelligence services. The idea that anyone involved in a group which held marginalised beliefs, whether political or occult, could be manipulated by communists was widely held. It’s easy to see why this message – ostensibly from ‘Mars Sector 6’, and voiced by King in a trance – was seen as barely-concealed communist propaganda. King was incensed when he read what he saw as an attack on his personal freedom and immediately dashed off a letter of complaint to New Scotland Yard, demanding to know what sort of scrutiny the Aetherians were under, and why. His letter was brief but indignant. In it King states that he is unaware of any scrutiny by Special Branch and states the Aetherius Society is not a club but a ‘religious and occult society, which has contact with Intelligences on certain of the other Planets. We are non-political and non-sectarian’ (letter dated 26 May 1957, Special Branch files). King requested a prompt reply, following this up four days later when his secretary, Grace Abercrombie telephoned Scotland Yard asking when they would hear from the police. It would be tempting to believe, in view of the prevailing Cold War tensions, that Special Branch had been monitoring King and his disciples since he went public with his beliefs, but this doesn’t appear to be the case. 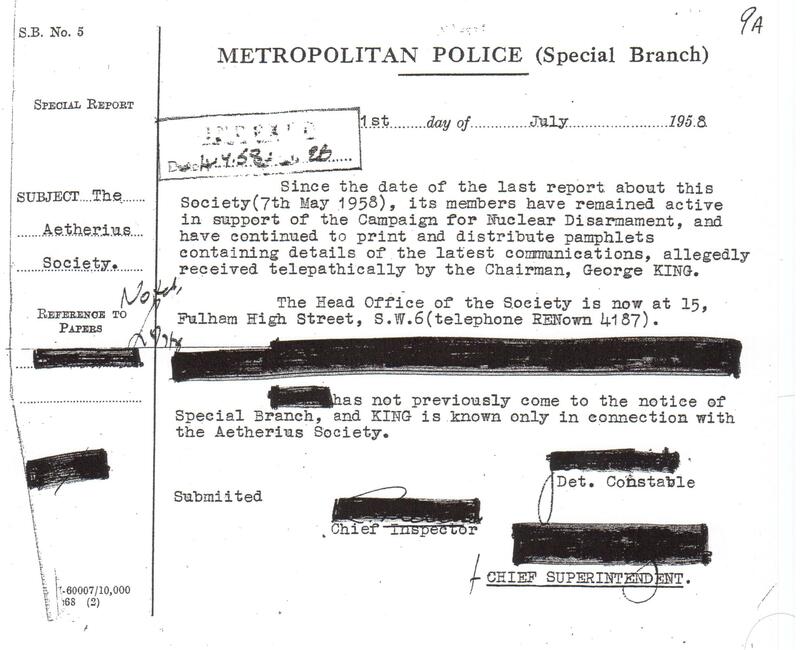 A Metropolitan Police telegram dated 27 May 1957, recording Ms Abercrombie’s phone call notes, ‘No trace Aetherius Society’ and ‘Unable to identify George King in S. B. Records’. Special Branch documents indicate that the Aetherius Society first came to their attention two days prior to the Empire News article, on 24 May, when a member of the newspaper’s editorial team brought a copy of Cosmic Voice to Scotland Yard and complained it showed a ‘bias to communism’. This was a classic example of a tabloid newspaper inventing a story as they proceeded to use this visit to claim Special Branch was conducting an investigation of the society! Of course, the Empire News had a stake in trying to ‘expose’ the Aetherius Society, as it was a notorious right wing paper. In keeping with other media in the fifties, it may also have had staff on its payroll that had contacts with police or intelligence community. Following King’s complaint an inspector from Special Branch, under instructions from the Chief Superintendent, was sent to interview King at his Fulham home on 31 May. In what must have been a surreal meeting for both parties the Special Branch officer firstly took King to task for complaining the Aetherians were being studied by Special Branch when in fact the Empire News had merely stated the ‘warning’ in Cosmic Voice was being scrutinised by them. King apologised, but requested written assurance from the Commissioner of Police to the effect that they were not being scrutinised by Special Branch. The Special Branch officer put King at ease telling him that he had ‘…been instructed to inform him that the Aetherius Society was not being investigated by this department.’ The interview then proceeded amicably, although King didn’t seem to grasp that by even being interviewed he, and the Aetherius Society, were under investigation. 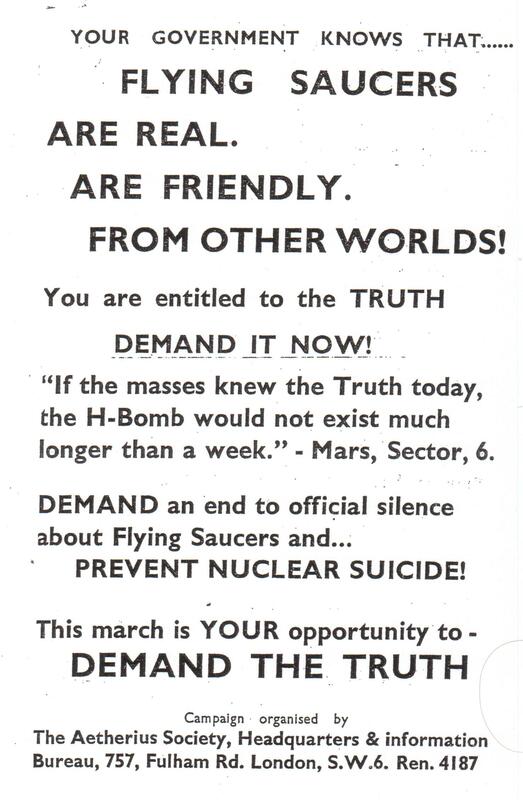 Special Branch may have been initially satisfied that King and his acolytes posed no threat in 1957 but the Aetherius Society now had a profile and Special Branch officers began to collect newspaper clippings referring to the society, highlighting any references to their anti nuclear warfare stance. In May 1958, they once again came to the attention of Special Branch, ‘during recent activities into communist activities in the Fulham area’. This brief report noted that the Aetherius Society was still, ‘…active in its campaign against nuclear weapon tests, and in this respect its policy is closely allied with that of the Communist Party.’. Yet another investigation took place but again police could find ‘….no evidence of open Communist association with the Society’ (Metropolitan Police Memo, 7 May, 1958). But Special Branch now had the Aetherius Society firmly in its sights and when George King announced a demonstration in London’s Trafalgar Square on 23 August 1958 they immediately decided to monitor the event. The demonstration was intended to explain the reason why the British government were, according to the Aetherians, ‘suppressing’ information about flying saucers’. Aetherius Society members started out from Speakers Corner (Marble Arch), parading through the West End of London before congregating in Trafalgar Square at 3 p.m. Although Special Branch claimed that only twenty Aetherius Society members were present, several hundred passers-by took an interest in the event. 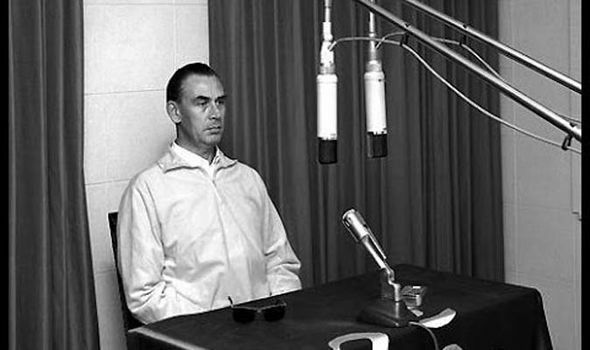 Several speakers addressed the crowd, regaling them with tales of saucer sightings and the afternoon concluded with a tape recording from Interplanetary Intelligence, Mars Sector Six. Unfortunately, the ponderous tones of the ‘intelligence’, allied with a collection for donations drove most of the crowd away. King may have enjoyed being the centre of what was as much a cult of personality as it was a flying saucer religion but whilst King did effectively make a living from the Aetherius Society, he lived a relatively modest lifestyle until his death in 1997. 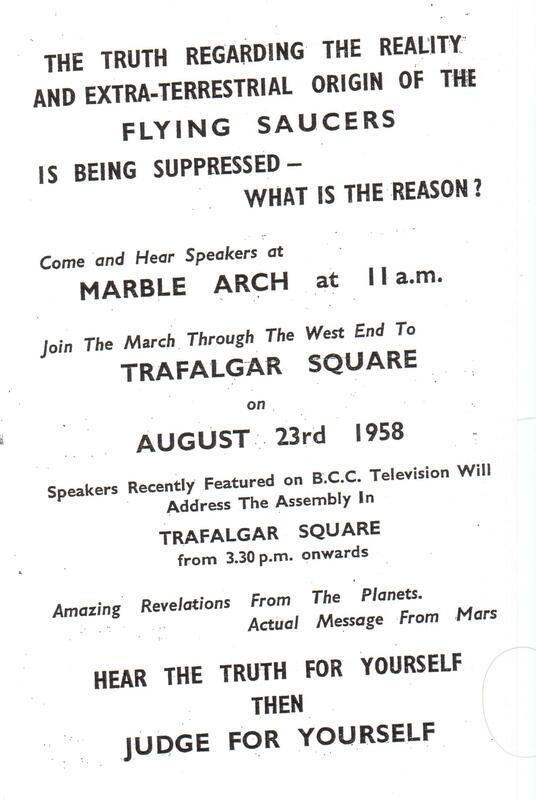 Another Aetherius Society demonstration took place in London during August 1959, which Special Branch also attended. This time the demands for world governments to reveal their knowledge of flying saucers and to work together to prevent the coming nuclear conflagration were made to about two hundred people. Belief in a government cover-up expressed by King and his followers were in essence no different to those held by the members of today’s Disclosure Movement. The only point of divergence is that King’s society described itself as a religion. At the 1959 demo amplified tape recordings of one of King’s extraterrestrial contacts, Mars Sector 6, were played and a petition calling for the British government to make an official statement about flying saucers was circulated. As the 1950s faded into the 1960s, Special Branch began to lose interest in the Aetherius Society. Their investigations had showed that whilst they shared many fundamental ideas, neither the organisation nor any individuals within it were overtly communist. The FOI papers reveal an underlying disdain for King and the Aetherians, one of the final memos stating: ‘The Aetherius Society is a crank, pseudo-religious, pacifist society…founded by George King who claims to be a spiritualist medium…’. For his part, George King remained aloof and didn’t let the Special Branch investigations hinder the development of the Aetherius Society. King and his members, however naïve their beliefs, were sincere and greater things were afoot. Note: You can watch the entire Lifeline programme interview with George King, that was originally shown on BBC TV in May 1959, on Adam Curtis’s blog ‘Mental Channel Number One – The Man from Mars’ – here. This entry was posted in Uncategorized and tagged Adam Curtis, Aetherius Society, Andy Roberts, BBC Lifeline, Empire News, Flying Saucerers, Freedom of Information, George King, Mars Sector 6, Metropolitan Police special branch. Bookmark the permalink.